← Let’s be Smart with our Smartphones – Ways to make it harder for Cyber Fraud. Microsoft has recently unveiled the Surface Tablet, the first computer Microsoft has ever made. Known for their success in computer hardware and consoles, it is a revolutionary step for Microsoft, who usually relies on others to create PCs, to reveal a computer solely designed and manufactured by the company. Microsoft hopes that this new hardware will allow users not only to replace Apple iPads but also their own Windows Laptops. However, this bold move was met with different reactions. Some were impressed by the intricate detail and industrial design, but many wanted more information. The Surface Tablet is set to launch in October and was stated to have made “no compromises” between tablet and PC capabilities. They are planning to roll out two versions. The first version will run on Windows RT and the other version will run on Windows 8. No price tag has been officially released but it has been rumored that the RT version will run around the same price point as other tablets. For reference, the basic iPad runs at around $499. The Full Windows 8 version will be comparatively priced as other ultrabooks of about $1,000. Windows RT will be 9.3mm thick and will weigh 676g while the Windows 8 will be “the pro” version with a size of 13.5mm and a weight of 903g. The RT will offer either 32GB or 64GB of memory while the Windows 8 version will have 128GB of memory. Both will feature a 10.6” HD display. Microsoft emphasized that the devices were just like any computer. They stated that this Surface tablet can be used for everything that a computer can offer. They even announced that the Surface will include a full-sized USB port and a 16:9 aspect ratio – the HD industry standard. Check out the image and videos below and share your thoughts. Do you think that this tablet has the capacity to phase out netbooks, ultrabooks, and other tablets? 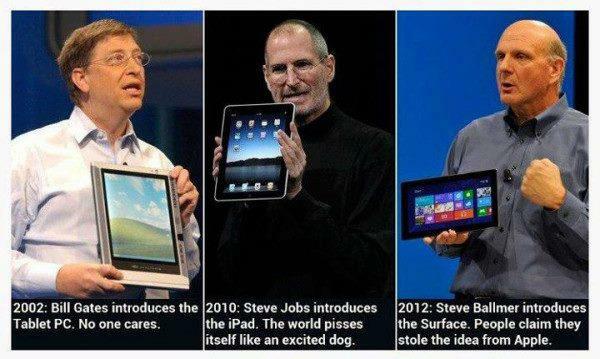 Do you think Surface Tablet a chance to rival the ever popular iPad in tablet dominance? This entry was posted in Apple, Business Tech, Cool gadgets and tagged Apple, IPad, Microsoft, Microsoft Surface, Microsoft Windows, Personal computer, surface, surface tablet, tablet, USB, Windows 8. Bookmark the permalink.